500 followers, say what? Thanks Kari for being number 500!!! I started freaking out because I had nothing planned and part of me wanted to do a giveaway , because teachers like giveaways, but I wanted to do something different. And then I started thinking about 500 and then the number 5. 5 favorite teacher items? 5 favorite books? The possibilities are endless! And then I remembered that we were talking about Random Acts of Kindness back at the beginning of the year. That's what I want! 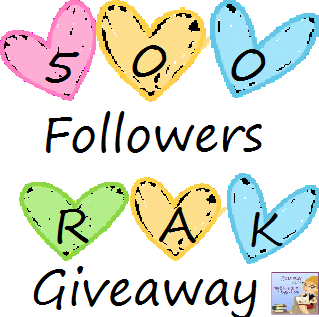 I'm going to combine two things...I'll have a giveaway and have something to do with RAK. 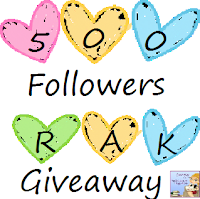 I'll give away 5 items from my store and in order to enter, you have to do 5 RAK. Not too difficult right? Need ideas on RAK? Well here is a RAK for you! Need more ideas? 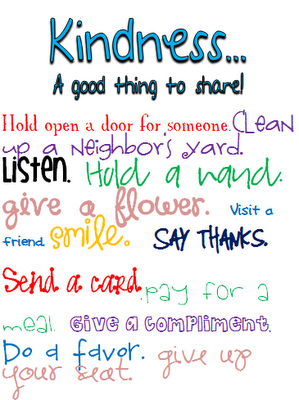 Check out the Random Acts of Kindess Foundation's list. Start thinking about your RAK!!! I tried to do some today while I was out shopping and I smiled at someone, struck up a conversation, and let someone go ahead of me. Ok, so all you need to do, is leave me a blog comment on 5 RAK you did during the day/week or what you plan on doing! 5 people will be winners of any item in my store(s). Click either button below to check the items out. I have more items on my TN as that's my first store. I am giving cupcakes to a friend. I met with grade level team today to discuss our school year (That doesn't start for another month) to help smooth transition for a new grade level member. I allowed someone at a 4 way stop go before me though I stopped first. The next time I'm near a pop machine, I'm going to leave change behind, and I will also do it at the kids candy machines. I really liked the RAK site. This week I returned someone elses shopping cart, I opened a door for someone, and I praised a parent for their child. I plan to let someone go in front of me in line and donate some clothes and toys. I would really like to make an effort to do something each and every day. The RAK site has some excellent suggestions! What a neat idea this is! Here are mine: I put a cart away for someone, I let a older lady ahead of me in line, I had a playdate with a friend of my son while his mom and sisters all went to see a "girlie" movie, I take care of my cousin once a week, and I gave a spare 20% off coupon to a shopper behind me. How did I do? 1) I held the door open for two older men that had a lot in their hands today at the library. 2) I introduced myself to the guy sitting at my table when I was using the Internet at the library - he was there filling out a job application on his computer! 3) I plan to write a letter (per the recommendation of the RKI website) to someone I appreciate - I will do this for all of my 5 mentors. 4) I made several positive comments on blogs today - I absolutely LOVE everything that everyone does, and I appreciate all their kind words for me. 5) I wrote a thank you note yesterday to one of my mentors for writing a recommendation letter on my behalf. Like others have said... I've always made sure that I do AT LEAST one good thing a day - whether it be a good deed or provide someone a compliment, I make sure to do this each and every day. I'm having a 2-0-0 follower giveaway - come on by! Love this!!!! My 5RAK: pay for a meal, hold my husband's hand (even when I am not in a good mood), laugh with my daughter, visit my grandma and sit with her, go to the park with my niece and nephew, just because. Mine are commenting on blogs, held open doors for others today, let a truck who couldn't get out of the parking lot go ahead of me, made the interviewers smile and laugh, and gave away some children's books. I held the door open for two people today, put away a cart for a lady at Dollar Genral, helped a woman put a tote in her car. Last but not least I am taking my sister to the Spa for a mani, pedi, and a hair cut! I offered to meet another teacher at school who is moving to a different school and help her pack up. I also offered to give her a flash drive with all of my fifth grade lessons that I have to help her. I picked up a dog from the AC they were going to euthanize and clean him up. I then took him to the beagle meet-up and created his webpage. I cleaned and organized my sister's book room. I brought my brother back dinner Sunday night. I think that is five. Thanks for the chance to win! I love this! What a kind thing to do :). 1. I chased some kid's parent down to give them their stuffed animal they left in the restaurant. 2. I let the poor man that only had one item go in front of my monster cart at the grocery store. 3. I was the DD last night for my friends. 4. I helped a teacher with a lesson plan yesterday. 5. I uploaded another free thing to my TPT store. Thanks for leaving me happy notes! 4th of July and 400! © 2015 Journey of a Substitute Teacher. Felicity Template customized by A Bird in Hand Designs All rights reserved.